I had the fabulous good fortune to attend the launch party of Martha Stewart’s latest cookbook: One Pot. Yes, I rubbed elbows with Martha herself, along with a bunch of celebrity chefs… but that’s not what I”m here to discuss! I am a huge fan of Martha’s cookbooks – while I have a fairly extensive library of cookbooks, there are only a handful that I refer to time and time again. A record high of 3 of hers fall in that handful (including this one). I highly recommend her cookbooks. As partygoers exited, we were gifted with our very own copies. When I flipped through it, I wasn’t disappointed – a bunch of recipes popped out immediately and I was very excited to make them. 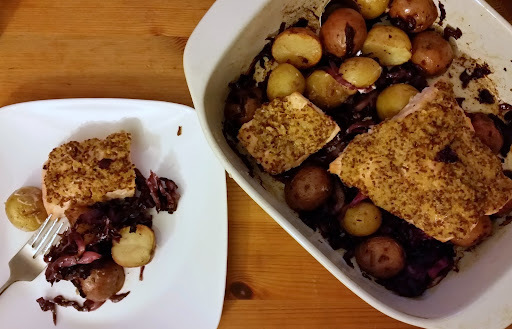 The first one I made: roasted mustard salmon with new potatoes and red cabbage. 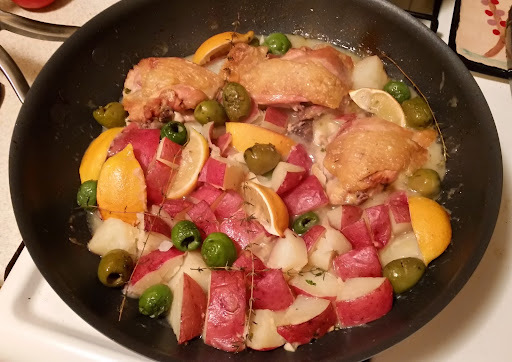 It was a no-brainer for a lot of reasons; I actually had all of the ingredients in my home already (minus potatoes; it’s nearly impossible for me to keep potatoes in my home because I eat them very quickly), and the entire dish comes together in the casserole dish. Seriously. Ridiculously easy, bursting with flavor, and totally delicious. This goes into the rotation, for sure – I eat a lot of salmon as it is, so a new way to make it was a welcome change. I’ve also never roasted purple cabbage, but this gave the cabbage such a nice sweetness that contrasted with the whole grain mustard/horseradish mixture so well… yum!!! And now the fun part: the PR company was kind enough to send over an additional copy of Martha Stewart’s One Pot for me to give away to one of my lucky readers! All you have to do is comment below with your favorite cookbook (and a link if possible) that you think I’d enjoy. Easy-peasy! I will pick a lucky winner on Friday, November 21, at 2:15 pm, so be sure to use your real email address and check back then!!! Good luck! Per usual, contest is not open to members of the Feisty Family, and only to residents of the continental 48 states. I was not paid for this post, and opinions expressed herein are my own. So much good food came out of that 70’s version from my mom. I am such a fan of Jamie Oliver and his Jamie at Home book is a treasure. Great photos and the companion TV series demonstrated how easy and straightforward his recipes are. It’s a nice looking book and I have enjoyed everything I have made from it (admittedly that is only about 3 recipes). I have to admit to rarely using cook books at all. The Smitten Kitchen archive of meals is fabulous though! 6 was the lucky winning number! Congratulations, Daina! Thanks to everyone for entering, and for all the wonderful suggestions – I will have to check these out! I dont use cookbooks – more likey to just use whatever i have on hand, you can stirfry anything! But I would like to cook more “fancy”, and one pot sounds ideal for lazy me. I don’t really have a favorite cookbook, but I like the Better Homes & Gardens ones. I second The Kitchn cookbook! Its wonderful. The barefoot contessa back to basics cookbook is my fav! Don’t laugh, I’ve been using Babe’s Country Cookbook a lot lately: http://www.strandbooks.com/vegetarian/babes-country-cookbook. I eat meat, but the desserts are terrific. I’m making “Brilliant Candy Slices” and two other cookie recipes from it this weekend.